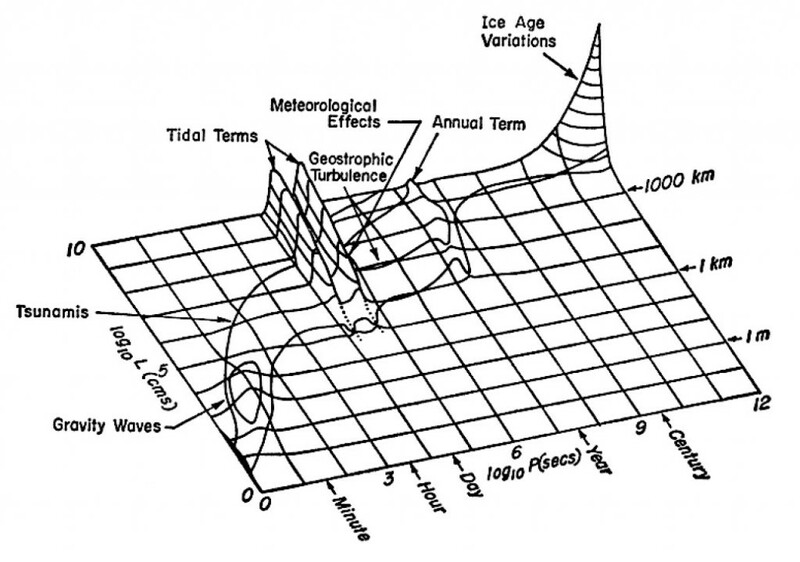 The paper provides an rich history of how the innovative oceanographer Henry Stommel created his diagrams to emphasize the cross-scale dynamics of the ocean (See figure below), and how his diagram was adapted by biological oceanographers. 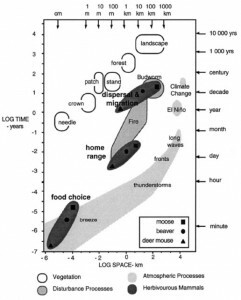 However, they miss how Stommel diagrrams moved into ecosystem ecology and sustainability science. Below I present a series of Stommel diagrams. 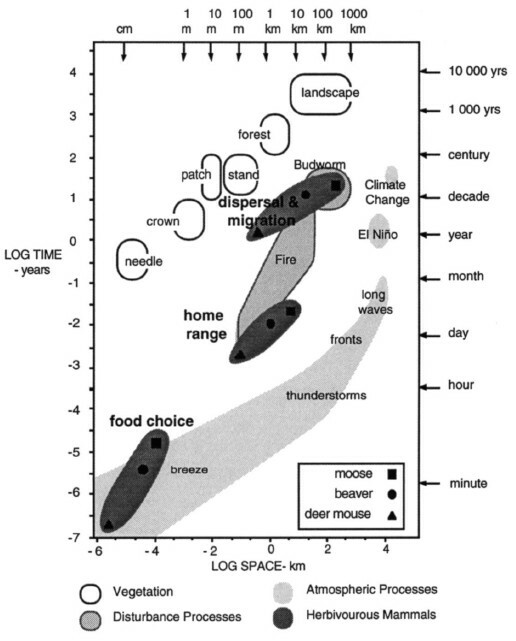 The first three figures are reproduced in Vance and Doel’s paper, the later three are from sustainability science. First, Stommel’s original figure, which was designed to show how oceanic processes varied across scales, and that sampling efforts had to be planned with a consideration of these. Though Brand’s book precedes Holling’s “Complex Worlds” paper, their dialog runs pretty much like that. And the discussion turns on a pair of interrelated metaphors: panarchy and pace layering. Holling and colleagues represent a familiar pattern of growth, conservation, release and renewal in the model of the adaptive cycle. A layering of adaptive cycles becomes a panarchy. The panarchy represents evolving interactions across ecological and social scales of time and space from, say, the pine cone to the forest to the forest products company. What can we learn by mapping pace against panarchy? Picture a stack of adaptive cycles, with frantic fashion at the bottom, and nature’s biophysical processes, broad and slow, at the top. Reaching from each cyclic layer down to the next is an arrow labeled “remember,” for memory is an important influence that slower cycles exert on faster ones. And stretching from each cycle up to the next is the arrow “revolt,” representing the actions that, in the time of the back loop – of release and subsequent renewal – can enact structural shifts in the cycles above. Thanks to Buzz Holling for the pointer. The adaptive cycle concept propose that crisis is followed by a period of reorganization that looks for new forms of organization. Often these periods rely of plans developed prior to crisis, and are helped by links to areas unaffected by crisis and legacies of past systems that preserve resources during a crisis, for more see Panarchy on RA website or on WorldChanging (Gunderson and Holling eds 2002). What if we could plan to use the future’s inevitable disasters as opportunities for change and innovation?The planning policy would focus on finding sustainable solutions to broken or destroyed systems. Disaster in this way is used to jump-start changes in infrastructure and thus alter daily habits, patterns, and preferences on everything from energy consumption to transportation, housing and health, economic development, community and civic facilities, open space, food, and lifestyle. Changes would be contingent on disasters occurring, so this type of planning policy wouldn’t necessitate immediate results without the destructive context – as would planning codes, LEED guidelines or simply better design practices – but it would produce readily-available plans and design-response focused on long-term, large-scale changes to infrastructural systems beyond the scope of a single, smaller-scale project. In the long-view I believe this would speed up the eventual implementation of large-scale change.